Despite the trend for pre-war baby names, some seem to resist rehabilitation. Will people ever start calling their babies Derek again? Alfie, Ruby, Archie, Jack, Evie, Florence, and Ava are all in fashion and conjure up nostalgic thoughts of working-class Britain between the wars. But there are some names that seem immune to rehabilitation. Will there ever be another baby Derek or baby Maude? There have been plenty of well-known Dereks in recent decades - footballer Derek Dougan, athlete Derek Redmond and left wing politician Derek Hatton. But it's hard to envisage a baby Derek in 2012. Yet in 1934 Derek was the 14th most popular baby name in England and Wales. In 1944 it had fallen to 27th in the list. In subsequent decades it fell from 37 to 43 before reaching 100 in 1974. It has not reappeared since. How many Dereks last year? Margaret was number one for three decades, beginning in 1924, but now is not even in the top 100. One theory has it that baby names skip a generation as fashions come and go. Or people let tradition dictate by choosing their grandparents' names. But why do some names disappear over time? The 1944 film noir Double Indemnity - Woody Allen's favourite movie - has a smouldering femme fatale called Phyllis Dietrichson played by Barbara Stanwyck. Today there is no room for a female romantic lead called Phyllis in Hollywood and there are very few actresses called Barbara. The American TV drama Mad Men is famed for its painstaking re-creation of the 1960s and many of the character names are much less popular today - Joan, Trudy, Peggy, Joyce, Donald and Roger. The bedrock for many British names is the Bible. But popular culture is increasingly influential. Royalty has a profound impact, with the rise of Kate and William now being followed by that of Harry and Pippa. Reality TV star Kourtney Kardashian called her son Mason. Since his birth in 2010 it has reached number 37 in England and Wales. At least part of the rise of Amelia has been attributed to last year's X Factor contestant Amelia Lily. Ethel - one of the most popular names in 1904 - doesn't feature in the current list. But this might change with the birth of Lily Allen's daughter Ethel last year. "My son, born in July, is called Derek. The initial reason was that my grandfather's name was Derrick. He was quite a lively character and always had a story or a joke to tell, so we've always liked the name. "We also wanted something that was a little different from the normal as we didn't want him to have the same name as many other kids at school. My grandfather was the only Derrick we knew of, so we were aware it was an old-fashioned name but that was part of the appeal. We are confident there won't be many others around. "We have had 'interesting' reactions to his name, some people like it while others look and say "are you serious?" or mistake it for Eric. The anaesthetist at our hospital said she had been working there 10 years and it's the first one she had seen delivered." This "celebrity cult" plays a huge role in influencing names, says sociology Prof Harriet Bradley, from the University of Bristol. But, it tends to be working class people who are "more influenced by culture than by tradition", Bradley suggests. Ten years ago baby names like Kylie, Jason and Garry for example, saw a surge in short-lived popularity. Of course, it's difficult to establish cause and effect. Instead of influencing naming trends, celebrity parents may merely be picking up on a naturally generated wave. Popular culture doesn't just boost names. It can kill them, points out Mark Forsyth, author of The Etymologicon. "Fictional characters matter. 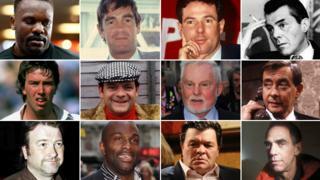 Think of Harry Enfield's Kevin and Perry - those names are likely to disappear." The 1970s sitcom The Fall and Rise of Reginald Perrin "did for" Reginald, which was 20th in 1904, he says. Basil - 80th in 1904 - is today irreparably associated with Basil Fawlty or Basil Brush. And who would choose Ebenezer now that it is tied in the popular imagination to the Dickens character in A Christmas Carol? Names have always come and gone. But now they do so at alarming speed. In Freakonomics, the authors Steven Levitt and Stephen Dubner wrote about the sudden emergence of the name Madison, which became one of the most popular names among the wealthy in the 1990s. A decade later it was in the top 10 list across all social classes and its social cachet had gone. "Once a name catches on among high-income, highly educated parents, it starts working its way down the socioeconomic ladder," they wrote. A name is chosen now as a self-conscious expression of the parents' personality. But parents choosing a name for aspirational reasons need to think about how it will go down in the playground, says Scarlet Brady, editor of the modern parenting magazine Gurgle. "You can wrap up all your hopes and dreams in a name but have to be careful that you don't put all of that on your child's shoulders." How a name rolls off the tongue is an often overlooked reason for why names have changed. Today's more tolerant society seems to prefer "softer sounds" like Charlie and Maisie over harsher sounding names like Reginald and Gertrude. The Reverend Rosie Harper, vicar of Great Missenden, Buckinghamshire, says parents look for different qualities in boys' and girls' names. Parents still like Bible names for boys - there are five in the top 12 - Thomas, James, Joshua, Jacob and Samuel. But the highest-placed girl's Biblical name are Phoebe at number 24, Abigail at 38 and Hannah at 41. "The Biblical names for boys are macho warrior blokes. They all have gravitas. Whereas what's chosen for girls tends to be Victorian names linked to image. They're not empowering, they're pretty names like Isabel and Olivia." The disappearance of Mary is part of this trend. It is perhaps too associated with Catholicism and the Virgin Mary for many parents in England and Wales. In the past, the unusual names parishioners chose for babies might have been because of older relatives, says Harper. "People choose names more randomly now - simply because they like them." Forsyth says the effect of the Google search will further widen the field of first names. People with a common surname like Smith or Johnson are going to look for more exotic names to help distinguish their offspring from all the other Smiths and Johnsons. "If you want to be recognisable then an unusual name like Boris is going to make you more searchable. Think of Boris Johnson - he needed that name. He's kind of stolen it from Boris Karloff and Yeltsin." Forsyth says he's happy with his Christian name. "My parents chose it because with Mark you are not limited. You can be a rock star or archbishop of Canterbury." Here is a selection of readers' experiences of being lumbered with an unfashionable name.